When I first starting using chalk paint, all I heard was “Yah, it’s expensive, but it lasts FOREVER!” Ok – obviously that’s not all I heard about it, but you catch my drift here. Then you buy the absolute best paint brush for chalk paint for around $30 and expect amazing results. Even with the best paint brush, it wasn’t lasting forever for me. I’d paint 2 pieces of furniture and use up almost 10 sample jars. I had a decent brush, I followed the directions, I didn’t understand what the problem was. I do remember when I took a class on chalk painting, the instructor who also sells the paint mentioned how she uses these really cheap brushes. The first time I needed more than one brush so I could work on multiple projects at a time, I went out and bought one of these cheap chip brushes because I didn’t feel like spending more money on a “good” brush. I just figured, this will work. Well work it did, because that was one of the most even coats of paint I’d ever applied with chalk paint before. AND I didn’t use near as much paint as with the recommended chalk paint brush. To be fair, you might/probably will end up with a few bristles that fall out while painting. I just pick them out as I go and touch up the spot. It really doesn’t bother me too much. What is the best paint brush for chalk paint? The best part is, you can buy 24 of them for under $12 (and get free shipping this affiliate link!). And even though some people throw them away after using them, I wash them out a time or two and reuse them a couple times before throwing them out. Do you have any tips about paint brushes or techniques that have worked best for you? UPDATE: I actually don’t use chalk paint anymore. Find out why here. But I still love using these brushes for oil based products! I’ve been wanting to paint something with chalkboard paint for ages. Thank you for the tip. I had noticed that too, my paint was not going as far as I thought it should. I think you are right. I was using Purdy brushes. Great brush, but for this paint maybe the cheaper ones are better. Depending on the project too. Here is to chalk painting cheaper!! With amazing results too!! Annie is to expensive!! Check out the brushes, chalk paint mix, and Cool waxes of all colors!! About to start my first project, an antique sideboard. I’m using graphite with clear wax. Looking for a smooth finish so your tips on thining and cheap brushes is invaluable . Finished product is for a bathroom refurb, hope to have a soapstone countertop and two sit on basins . Here goes! Hi there, I’m just starting with the chalk paint… I’m having a lot of ‘streaking’ where the lines show… Does this also happen with the chip brushes? Also, is there a trick to avoid this? Thank you! It does still happen, and honestly I think getting rid of the streaks is something that just comes with making yourself more familiar with working with the paint. I know I used to have alot of streaking, and I don’t notice it with my pieces anymore, but I can’t exactly pinpoint what I’ve done differently. You might try adding a little bit of water to your paint to thin it out and painting lighter coats. That should help even out the streaks. Good luck! I’m a rookie at chalk painting; so far I’ve only started on a couple of nightstands that I will hopefully be finishing up this weekend. I had bought some of these chip brushes since I’m starting on a budget, but I wasn’t sure they were doing the job. I, too, have heard many people say of chalk paint, “A little goes a long way.” But I didn’t feel like that was happening for me. I will try adding a little bit of water! I was about to go and buy a very expensive Annie Sloan paint brush, so glad I read your post! Don’t they shed a lot of hairs though? I was professional faux painter for 10 years. Chip brushes are the best ever. Used them for all glazing for furniture and trim. I would wash them several times and rub them to get the hairs out. As you continue to use them, the hairs don’t fall out much. I would keep some chip brushes for years. The older the better, because no more hairs falling out. Keep a tweezer on hand. I was at store today and almost bought the Annie Sloan brush, now I’m wondering if I should just try it with chip brushes. I’ve been using the chip brushes. I just think the chalk paint brushes soak up ALOT of paint. And since it’s pricey anyways, I prefer the chip brushes. I reuse mine all the time and haven’t had any trouble with them! I am going to use chalk paint for the first time (for furniture) was really wondering what should i do about brush, coz I just cant afford the AS brush. Was going to buy just this 1 dollar brush, and you gave me an encouragement :))))))))))))))))))))) Also, question, for waxing??? too? Can I use this dollar brush for wax too? thank you. See DaddyVan .com for a beeswax polish for chalk paint. They have a great video. Have ordered but not yet tried. I prefer to use poly instead of wax for a more durable finish, but I know there are situations where the wax works just fine! Im so glad that you mentioned polyacrylic! I’m about to paint my first chalk paint piece & I’ve been researching what finish to use. Im using AS graghite & of course I hear everyone recommending her wax. But I am painting two end tables which will bear a lot of drinks, scratches, everyday use. So I’m nervous about only using the wax. I also heard of the polyacrylic/ polyurethane, but I don’t want a glossy finish, I like the matte look of Chalk paint. Can you please recommend what finish to use for the top of my end tables for everyday use & what brand? Thanks! Rustoleum chalk paint also does a flat matt finish top coat varnish £12.50 for a 2.5litre can. Same price as the chalk paint. Hello! I am also a rookie and I pur hated a vintage vanity recently. I want to use the AS CP and not use the wax. You mentioned that you prefer the polycrilic instead of the wax. Is this OK to use over any and ALL chalk paint? I think it would be so much easier and faster to use. Yes! It’s really ok. Quite a few professionals I know recommend it! Thank you Kayla. You are always so helpful. I don’t know how the word “purchased” ended up being spelled as “pur hated” but I’m glad you recognized what I was asking. lol Merry Christmas! I use these cheap brushes too!!! I think they work way better! Everyone is going on about the big expensive $40 Annie Sloan brush and I can’t figure out what all the hype is about. I buy these by the box at harbor freight. Gotta love brushes that you don’t have to wash out! Especially with homemade chalk paint. I am all about saving money. I agree! And I do usually wash them out a few time and reuse them! Love them, too! I just painted with chalk paint for the first time today. First time painting furniture actually. I could believe how much of AS paint I used! So glad I found this. I was using a really thick brush and it was just eating up the paint. I am going to use much thinner brush for the second coat tomorrow. Thanks! I wanted to know does the chip brushes leave the streaks behind? Hi, I’m in England and have been using Autentico, I love the paint and it’s cheaprer than ASCP, but I haven’t had much success cleaning my brush out! All the hairs stick together like glue. I’m wondering if it’s the brush as no-one else seems to have this problem lol! Any help? Justine, I’ve never had that problem either. All of the chalk paint I’ve used washes out really easily, even dried out brushes that have been laying around for days… Sorry I can’t help you out more! Thank you so much for sharing this! Just about to start my first chalk paint project. I already spent enough on paint and wax, I couldn’t spend $40 on a brush! Can’t wait to try, I swear by those chip brushes for other projects. Glad to help! Good luck on your project! 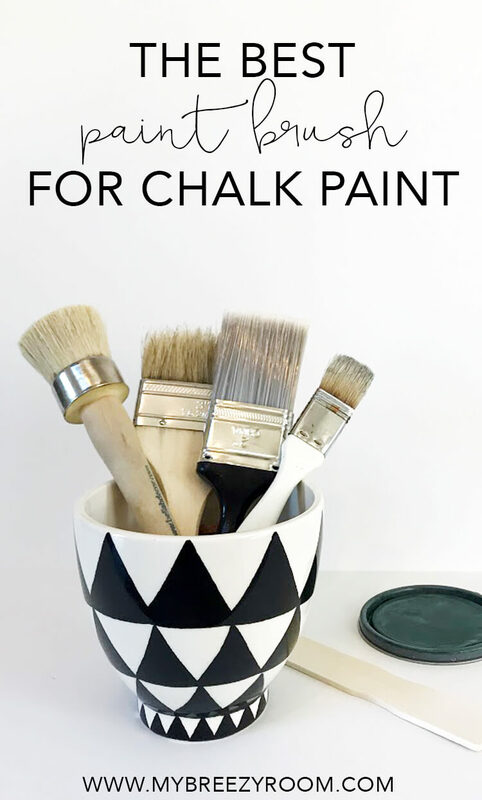 Wondering how Mod Podge over chalk paint would work to ptotect it? Has anyone tried it before on Mason jars? I haven’t tried it! I now use Modern Masters Master Clear to seal in every type of paint I use, including chalk paint, and I love the results I get with it. Definitely worth the higher price tag. Do you get a matte finish? I just painted for the first time with chalk paint, and after getting halfway through a bookshelf and trying two coats in some areas, I’m bummed. It’s all streaky and uneven. Would chip brushes be the best thing to try next? I’m going to buy AS CP today – and wondering about the ratio of water I should add… Do I add it to the can? It will be my first paint job, so I’m very excited but also nervous!!! Hey Kayla, sorry I’m so late in getting back with you! I would pour the paint out of the can then add a little water. Start with just a couple tablespoons and then add more if needed. Chalk paint is something you’ll get better with the more you use it, but you really can’t screw anything up too bad. Good luck! I painted I first chalk paint piece this past weekend. I also purchased the cheap brushes. The guy at the hardware store told me to cut the end of the bristles off and it worked perfect. Couldn’t you use a foam brush? I haven’t tried any brush yet. But was wondering if the foam brush would stop the streaking factor. 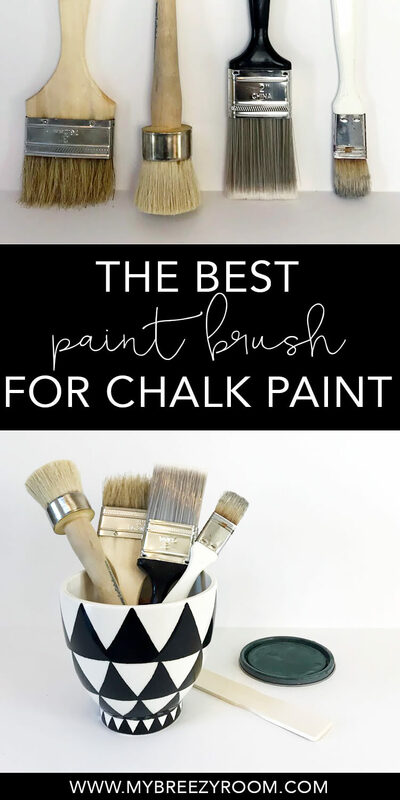 I too use chip brushes but I have not tried the chalk paint on anything yet! Hope my project goes “smooth “. I’ve noticed some pictures with the paint poured into a bowl. Is there a reason for that or can’t you just dip the brush in the can? Also you mention using water to thin the chalk paint to prevent streaks..I thought thinner paint would make it streakier. I’m a newbie at this.. I have an old cabinet I want to paint white.. Here is my tip for the chip brushes, you should condition them before you use them. Hold the brush in one hand then place the bristles on the palm of your other hand and circle the bristles around going clockwise and counter clockwise. This will help any bristles that are loose to start shedding so you can remove before you paint. It won’t get all of them but it will help minimize the amount when you are painting. Also B B Frosh is a great alternative to make more cost affective chalk paint. Thanks, Sherri! Those are great tips! I’m a rookie at chalk painting. Right now, I am painting a very small corner table (to learn with) and am going to apply the black wax over it. Should I coat the table with the clear wax two times before using the black wax or only once? Also, what brushes do you recommend for the waxing? I’m not sure on the one or two layers of wax, because I would use a clear coat and glaze, even over chalk paint. However if you are going to go with the wax, I do think the waxing brushes sold by chalk paint companies, while pricey, are the best ones to use. Hope that helps! Thank you so much for your reply. I did use two costs of clear wax before using the black wax and I am not happy with it. Going to use your technique with my next project instead of wax. Do you use a topcoat directly over the chalk paint and then a glaze? Sorry for so many questions – can you tell me which glaze you use? And, is the glaze tricky to use? Yes do the topcoat, then glaze, or else the chalk paint will wash right off when you’re wiping back the glaze. I have used a lot of different glazes. Valspar premixed glaze from Lowes is the easiest to get ahold of and start with. I’ve also used General Finishes and like it a lot. Glaze is a little tricky to use, you may want to practice. The good thing about it is there’s no “right” way to do it, so as long as you’re happy with the look, then it’s right! You just apply it then use wet cheesecloth or a wet rag to lightly wipe it back until it’s to your liking! Kayla, you are so awesome! Thank you so much for being patient and answering my many questions! !